For our Members there is an exclusive advance ticket offer giving £5 off the Sat/Sun door price. See the Exclusive Club Weekend Ticket Discount email you will have recieved for details and discount codes. Club single ticket offer is limited to four tickets per member and the club family ticket offer is limited to one family ticket per member. 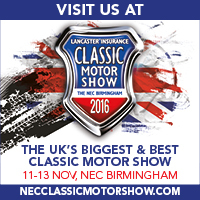 Don’t forget to hand in your ticket stub or print-at-home voucher to your club’s stand at the show so they benefit from a commission. Calls cost 10ppm plus standard network charges. All bookings are subject to a single transaction fee of £1.50. Book before midnight on Monday 31st October to be automatically entered into a free prize draw to win a HERO Cup limited edition Zenith Open Face Chronomaster watch worth £7,000 (inc. VAT) courtesy of Hero Events.